Construction of a new four-story, 26 unit residential building with support facilities. Energy Conservation work funded by DCCA. Multi-unit project -- day care center constructed later, see below). Conversion of a former Provident Hospital Nurses' Training Facility to 25 apartments and support facilities for women with children that have been impacted by AIDS. Construction of a new 20,000 sq.ft. building dedicated to serving children impacted with HIV/AIDS. 1st place in the Chicago Neighborhood Development Awards 2002 ‘The Richard Driehaus Foundation Award for Architectural Excellence in Community Design. Conversion and renovation of an existing building containing 24 apartments and renovation of basement space for a four classroom daycare center for 100 children. De-conversion and renovation of existing 48-unit building with a majority of one bedroom units to a total of 36 two and three bedroom units. 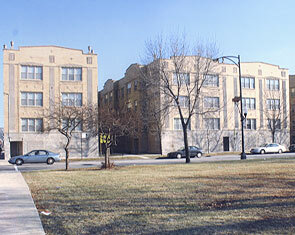 De-conversion and gut renovation of existing 30 unit building to 24 unit building. Construction was super-insulated as required by ENR. De-conversion of existing 57 unit building to 54 units. 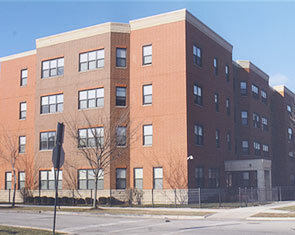 The goal of this project was to construct an energy efficient "moderate" rehab, including 3 accessible units. Gut renovation of a 10 unit building. Construction was super-insulated as required by ENR. Radiant heating embedded in all floors. Rather than demolish this existing 4 unit building, we de-converted it to 2 “side by side” townhouses. The focus of this project was to use renewable & recycled building materials, "green" products and include the standard ENR energy efficient details. In addition, we used a combined furnace and hot water heater. Renovation and conversion of an existing one story grocery store/office building to a 20,000 sf daycare center for 120 children and 12 infants. 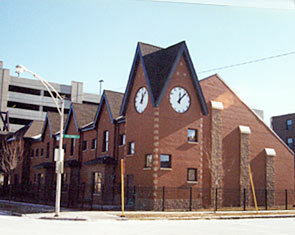 Existing office building converted to a facility for Head Start for 34 three to five year old children. Converted an obsolete health facility to a teaching daycare center. Designed a multi-purpose room addition to the existing church; included commercial kitchen and connecting link to main church. Designed interior spaces for a store and cafe on the first floor. Created a plan to rehab 11 buildings containing 120 apartments; unified buildings through common backyards, landscaping, and signage. New 25-unit townhouse development on three sites. Affordable, family sized units with attached garages.